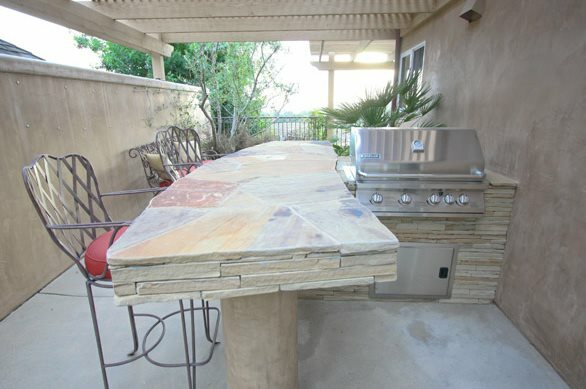 If you’ve ever looked into outdoor kitchens, you know there are a lot of options. 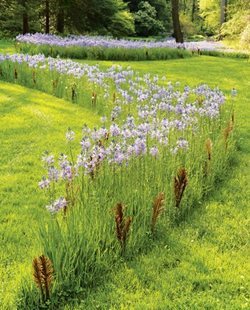 If your head is swimming with sear zones, beverage stations, and far too many dollar signs, it’s time to embrace the age old mantra of less is more. Check out this collection of small outdoor kitchens that get the job done in limited space and on a limited budget. 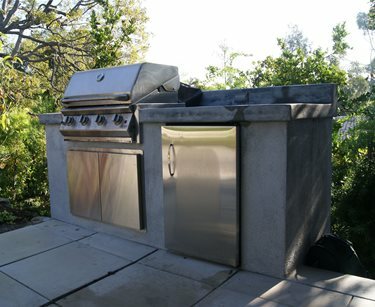 This modestly-sized outdoor kitchen sits on a 10x15’ bluestone patio. 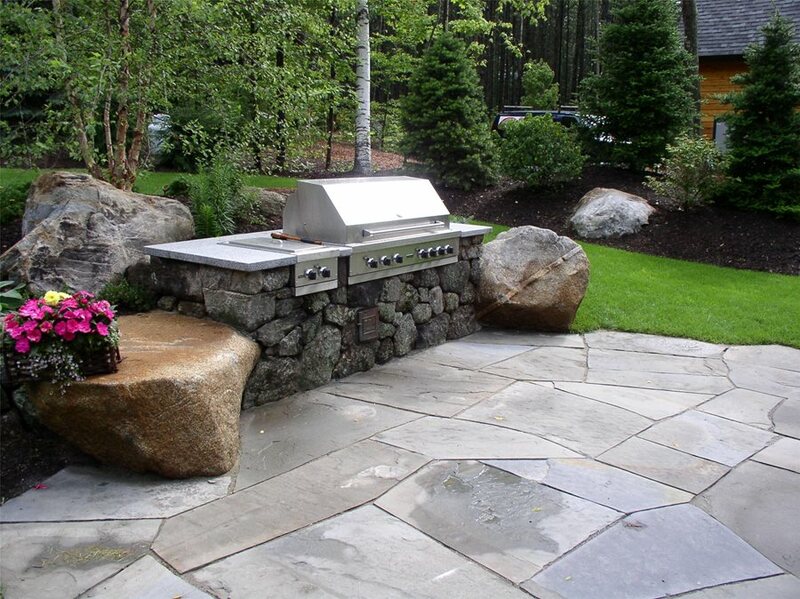 Designed by O’Leary Landscaping in Harwich, MA, the kitchen features top-of-the-line materials and appliances. 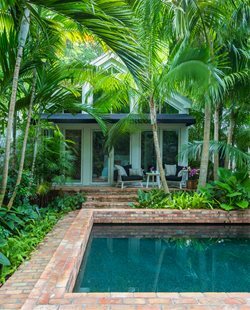 This is one benefits of reducing the size of an outdoor kitchen; high-end materials are more affordable in small quantities. The base of the kitchen is faced with New England round stone, while a bluestone slab was used for the counter. 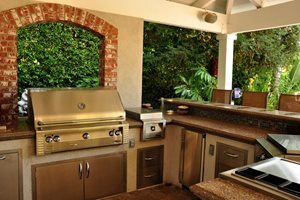 Many homeowners find that a grill and small refrigerator is all they need in their backyard. 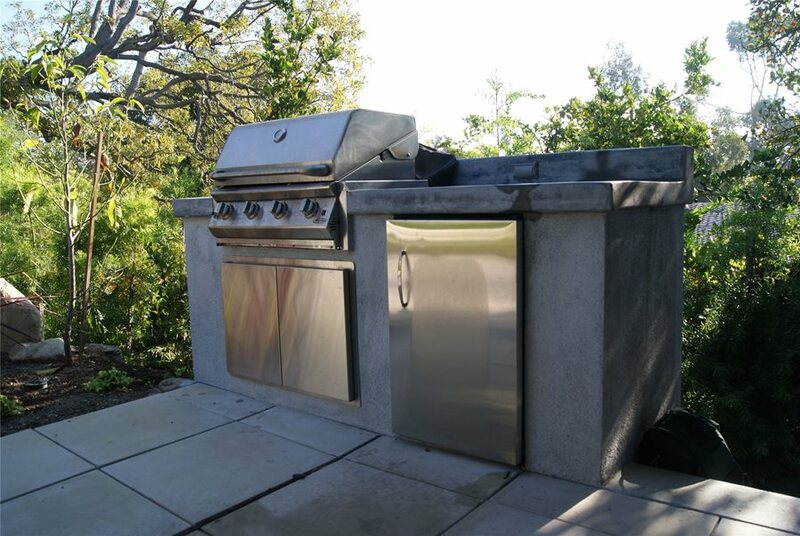 For the average entertainer, the ability to barbecue and having a convenient place to grab a cold drink are sufficient. 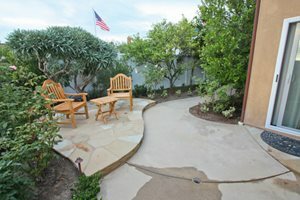 This outdoor kitchen is part of a modern backyard designed by Z Freedman Landscape Design for a bachelor living in Venice, CA. It is located near the home’s indoor kitchen so that both cooking spaces can be used in conjunction. 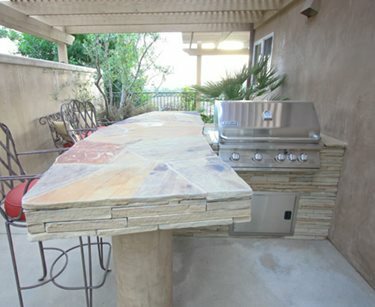 When designing a small outdoor kitchen, the one thing you don’t want to skimp on is counter space. 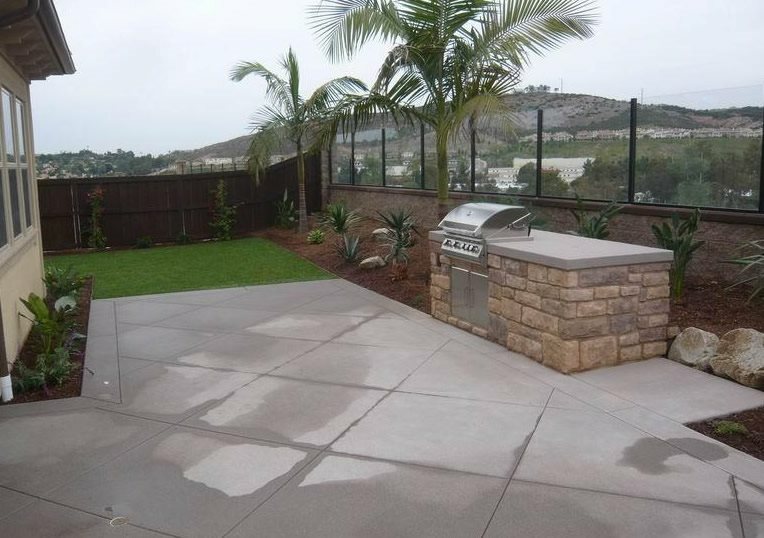 This example, installed by Quality Living Landscapes in San Marcos, CA, has counter space on either side of the grill. On the left there is just enough room for the cook to set a platter of food ready to be cooked, on the right there is much more space that can be used to serve food. Make sure you have an open counter space that is large enough for a few serving platters and bowls. 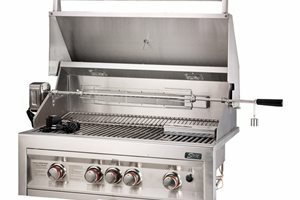 Deciding to go small and streamlined does not mean your grill needs to be small and streamlined also. 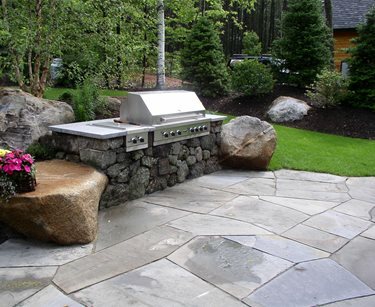 This rustic looking kitchen, designed by Belknap Landscape in Gilford, NH, features a powerhouse of a grill. With six burners and a monstrous cooking surface grilling for a crowd is a breeze. An added side burner extends the cooking options even further. Small grills often end up tucked away in an isolated portion of the yard. 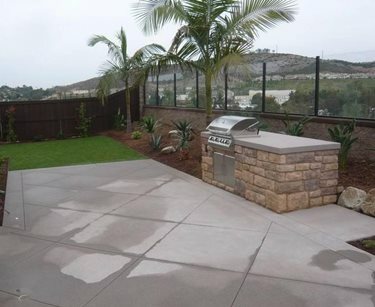 Here, DC West Construction in Carlsbad, CA placed the grill on the side of the house. Knowing that this may leave the cook alone while the party takes place around the corner, they built in a raised bar so that a few guests could provide company to the person cooking. The split level design accommodates a pair of barstools, turning a utilitarian cooking area into a social space.